Salming Running market themselves as a natural running shoe brand. The shoes are designed with a holistic approach. At this point Salming Running offers four different running shoes. 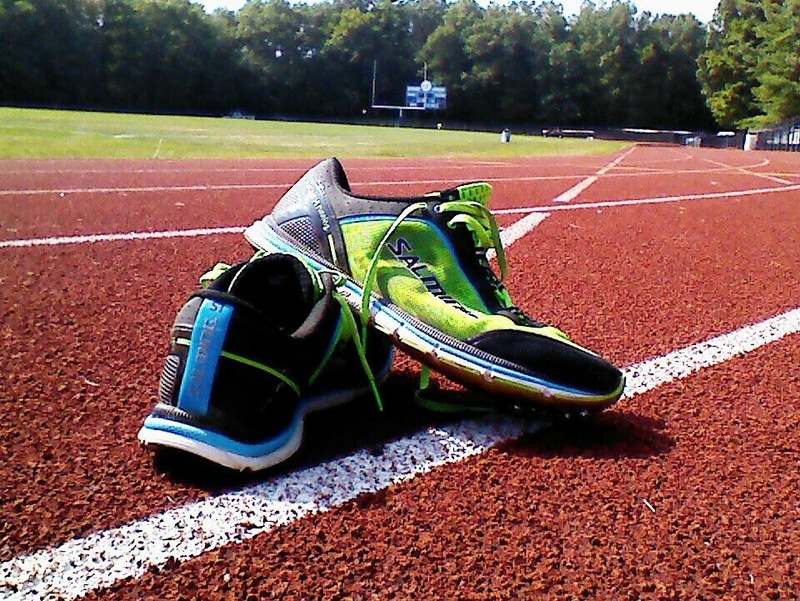 "Distance" (most cushion), Speed (Performance shoe), Race (Racing flat) and Xplore (lightweight 0mm drop). The Salming running shoe line up is very self explanatory and I have to admit, it does not have to be more complicated then this. 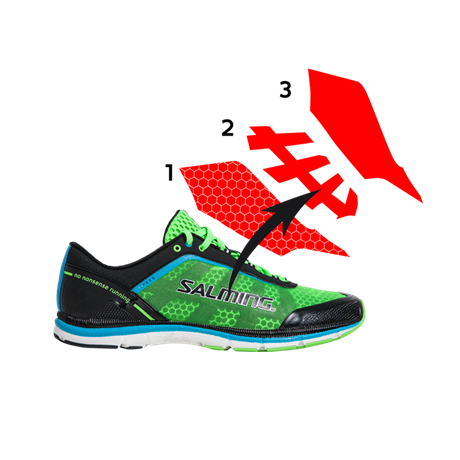 On Salming Running's website you will find ton of information about their shoes and the approach. To me "natural running" is an organic feeling, you can connect with the road and the shoes are not in your way. 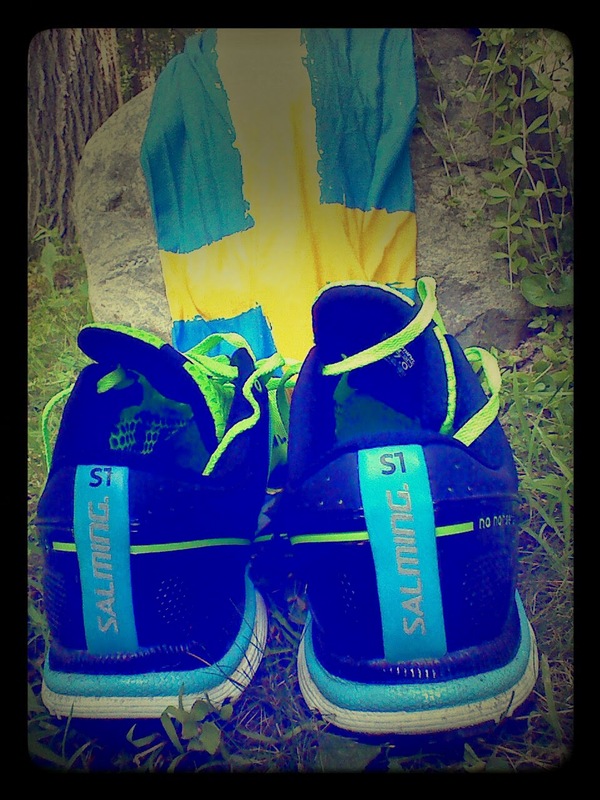 Salming Running and Speed1 offer just that feeling. 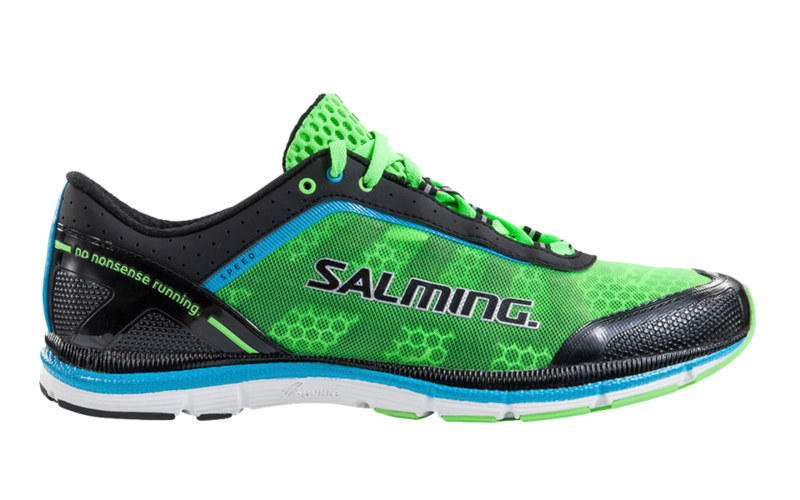 Salming says: Covering mile after mile calls for a combination of comfort and durability. Accordingly, our shoes designed to function in more rugged environments utilize a 3 layer upper construction. A first layer of mesh material adds comfort, while the middle stabilizes lateral movements and reduces pressure on the foot. The exterior thin net mesh encapsulates and wraps up the front in a neat fashion, adding durability to the shoe. The upper has been great during a hot humid summer here in NJ. The upper breathes well and dries up fast. The feel is very smooth and I feel that nothing is in the way. You will find a simple lacing system that is easy to get an even pressure, not creating any hot spots. The upper wraps your foot well with out any bells and whistles. The mesh closest to your feet offer a really smooth feel and if you prefer, you would be able to go without socks. The upper reminds me how the first version of Kinvara felt. Very light and smooth. The RunLite™ midsole features a special High Abrasion Injection EVA, designed to create a nice feel for the ground. The midsole is light and responds to the surface in a flexible way from the very first step. Our standard heel to toe drop of 5 mm sets up a natural running posture, allowing a correct lean throughout the stride. This drop is used in Distance, Speed and Race models. We say: Last couple of years I have been using 4mm drop shoes. Salming Speed comes in 5mm, to me the 1mm does not make a difference in feel. I get the same great road feeling with 5mm. Drop is all about preference and a low drop shoes might not be for everyone. The Runlite foam offers a really firm responsive ride, and I think with the low profile of the midsole that Speed offers is the glory of this shoe. You dont have to much, just the right amount of protection between you and the road. To me this is "natural running". "Lightweight yet with sticky characteristics, our blown rubber compound is strategically placed to provide you with great grip in all slopes, twist and turns you might encounter. This particularly durable outsole material is used to further enhance the long-lasting characteristics of the shoe. The special rubber compound will get the most mileage possible out of your shoes." Outsole rubber has a great grip and you feel secure in all weather conditions. Speed has a smaller amount of rubber then a traditional running shoe. I wore out the non protected area in the forefoot faster then the rubber covered parts. I would have preferred to have this area covered as well, for more protection, faster transition and better durability. All the rubber covered parts durability shows normal wear and tear to me after 300 miles. "The distance from heel to the ball of foot (62% of the shoe) has been designed with extra stability, which ends in the so-called “ballet” line, a 75° angle. In front of the 75° line, we have equipped the shoe with greater flexibility to stimulate the foot’s natural movements. The TGS 62/75° featureassures that the shoe bends in exactly the right places, stimulating the foot’s natural lateral and forward movements"
The shoe itself has no added features for stability, but the shoe is built low to the ground and it is supportive and secure enough for my gait and stride. Speed is not the most flexible shoe on the market, but compare to other running shoes in the performance category I would say Speed offer the same amount. To me the flexibility is enough to get me up on the toes fast. The 75% make sense, but I'm not the one to judge if this number is the right one for your foots anatomy. Speed1 offers a really close to the road feeling. The shoe really shines when you pick up the pace and you can enjoy the firm responsive ride. The firmness works well together with flexibilty and you get up on the toes quick for a fast run and turn over. great review stefan, and a very promising first impression from Salming USA! congrats to all! After seeing the Salming ads on Facebook, I decided to give it a try. I bought the women's distance A2 and xPlore, the former I use for road running and latter for treadmill running and strength training. The fit is very comfortable with right heel slippage in the A2, but I am not overly concerned with it because all my shoes fit the same way. The ride feels fast with more than enough cushioning. However, I do have a question. What is the difference between the A2 and the Distance? Much appreciated! Race has a a similar feel, but is much lighter. It also have a carbon plate built in, in the midfoot area, to add some support and for a faster transition. Upper mesh is different and more breathable. If Speed is your Marathon shoe, Race is your 10K shoe. Hey this is a very helpful review :) but I also have a question. I've been looking at the Women's speed shoes and the Junior's Speed. For me y look the same (with the only difference in the price). It's a little confusing for me because the Junior's have the same sizing as the Women's (or at least the chart I was looking at shoes that). Is there any difference at all (except may be for the purple and blue line over the sole). Thanks for the help! Great question Marsela! The junior is built on the speed platform so aside from the “paint job" you mention, its the same shoe. Foam is the runlite and can be used just like the Speed. Hope answer was helpful? Also for a beginner runner is it better to get the Speed or the Distance shoes? What is ur experience? 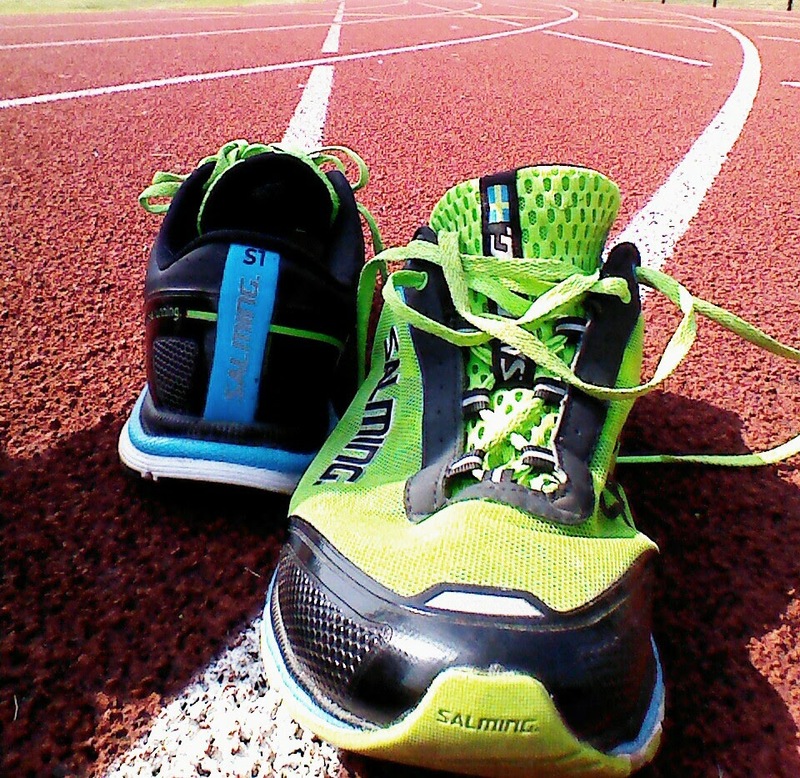 I'm not sure if using Salming Running Speed1 for running track how long will?It can cause heel pain and foot does not?With its design, then I'm satisfied.